My nephew is 18, he graduates high school this year and is moving out on his own. He was talking to Scott about his plans to buy a puppy- he was originally thinking of a Saint Bernard, then Scott encouraged him to think about a boxer. Well my nephew has known our dogs and so he was talking to a buddy of his who also has a boxer. Well this buddy has a male and they decided that if my nephew gets a female then they can breed them "it would be fun to have puppies". So Scott comes home and asks me "you know boxer people, can you find him a good female?" I told him yes I could- for a pet. I told him the chances of finding a reputable breeder that will sell him a female puppy (with no contracts) knowing that he intends to breed her and has no intention of showing or anything of that sort is pretty much nil. I told him that there are a couple of boxers in rescue that he could put in for adopting- but no they will not be breedable registered dogs. Long story short- Scott is not going to do anything to discourage him from jumping into breeding his first dog. Scott says, well he's going to do what he wants anyways. I said that's fine you don't have to discourage him but PLEASE help educate him. Scott is being such a ..... about this. Then Scott says, well when we bred Savanna we didn't do it all perfect. I told him no we didn't. But we did everything that I knew at the time to do, and even then we at least did blood work, had hips tested and EKG done, we took the time to look for a stud that had specific qualities and we sold puppies on a spay/neuter contract. I asked him if he told our nephew that we did NOT make money on that litter- it cost us money. Scott says, "well he's going to do what he wants, you could at least help him find a good puppy". Ok. So I told Scott, yes we bred our girl Savanna, but had we known someone with more knowledge we would have done things differently. I'm happy that my nephew wants a boxer, but I want him to have the information he needs to make an educated decision before even thinking about breeding. I guess he has already found some puppies for sale in the news paper and he thinks he's found the litter he's going to get one from (it's only been a couple of days). I am going to make a list of things he should ask the breeder about and some info about genetic health problems that our beloved breed is prone to. If he wants to buy one of these puppies that is fine, perhaps they will all be of good health and no problems and I hope that is the case for him. But I want to do all that I can to make sure he thinks things through, especially about breeding. So I am going to write down this website for him and encourage him to come here and talk to some you who breed and hopefully (even if he does buy a BYB puppy) he will make the right decisions, when it comes to the future of his dog and any others he may get in the future. Any advice on more that I can tell him? Ok, so I was able to talk to my nephew my self and he decided against getting one of the puppies from the gal he talked to. Her puppies are CKC (continental kennel club) registered and she was selling them at 6wks. I told him that is not the same and AKC and we discussed registries and why they are important. We also talked about genetic health (and non genetic) problems that boxers are prone to and expenses. We also talked about the importance of the time puppies spend with the mother and litter as well as behavior and we got into nutrition a bit. After talking he didn't seem to be all that interested in breeding- more just wanting to have a boxer to enjoy. He went online and did a bit of looking into the whole CKC registry thing and realized it isn't much more than a joke. And to think of all the people with ads in the paper who tell people that CKC and AKC are "basically the same thing". So he decided not to get a puppy from her. I gave Scott the name and number of a good breeder to give to him so that he could get better guidance and help in finding the right puppy. As my husband pointed out, not everyone thinks like I do. His parents want to buy him a puppy (as in now) and they don't see/understand what is wrong with the great majority of puppies being sold in the newspaper ads. Scott called me yesterday (Thursday) at his lunch break and gave me the number to an ad that my nephew had looked at, and asked if I would call and talk to the lady (I actually called and talked with several). So I did. Basically did the whole interrogation thing with her. She has multiple dogs- she own both parents. She doesn't show and she doesn't do health testing (but at least she new what tests I was referring to) and we got into a deep discussion of boxer health. She was at least honest in answering all the questions I was shooting at her and not afraid to discuss them. She says that she has never had any health problems with puppies that she has sold in the past (I've heard that a million times) but she is also willing to take back a dog if it is determined to have a problem. 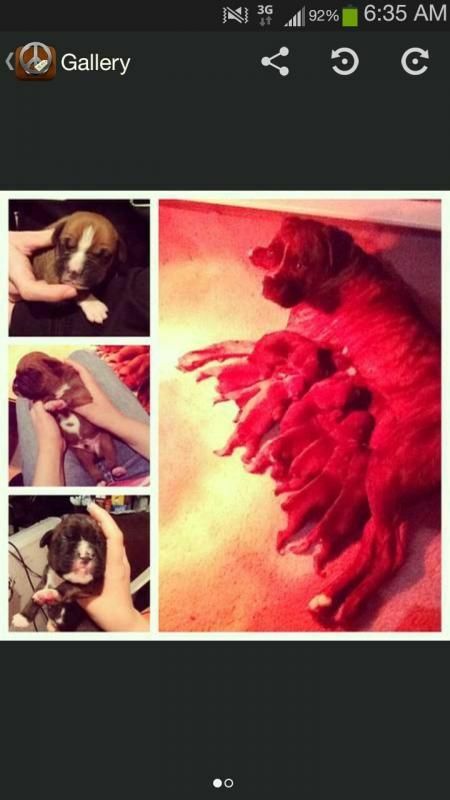 Her puppies are 10 wks old and she had two sealed brindle males that were available, one flashy and one rather plain. She said that she had been working with them on house manners and potty training. Although not what I would ever consider a reputable breeder, she seems better than most of the others with ads ( I had one gal respond to my question of health testing with "They have all tested clear for rabies"
Long story short my nephew called the woman with the two brindle males and he and his parents set up to go look at them. I gave him a brief review of things to look for/at while he was there- not just of the puppies but also the sire, dam and her other dogs. He went home with the little flashy boy. I can't help but be happy for him and I hope this pup will be healthy and problem free. I also hope that this will be a good experience for him and perhaps his next boxer down the road a few years (It's nearly impossible to not want another boxer at some point ) he will spend more time checking into different breeders and what makes a reputable breeder vs a byb. He text Scott a picture of the puppy on their way home, he is very excited and happy about his new puppy. So I have now written down the name of a good trainer in the area and some info about puppy and obedience classes as well as about the CGC test. Well, it isn't the perfect outcome, but it is better than it would have been! Rome wasn't built in a day - education takes time too. At least you have a feel for the person and the pups got more than the minimum time with their mother. 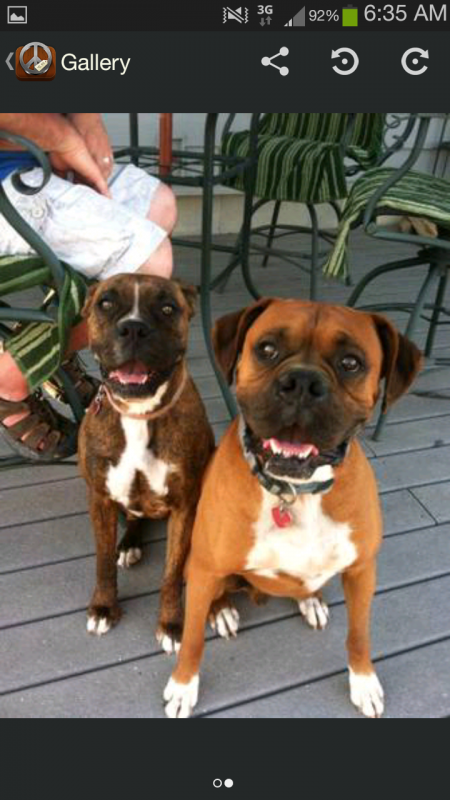 Maybe Laila needs a playdate do she can teach him some Boxer lessons. Well, it isn't the perfect outcome, but it is better than it would have been! I am so glad that I had the chance to talk with him before he went through with buying a puppy from the first gal, and that he listened to the things that I said. You're right about things taking time, it's a start. And who knows, maybe he can teach his friend some things too. He did ask our opinion on what to feed and he has stocked up on toys. At least he did listen to you in regards to the first breeder . What drives me nuts is when a friend / family member asks my about a breeder / puppy and tell me they know I will be honest with them and have the best for them in mind. Then they go and do the opposite of everything I said . I think you did the best you could and talked some sense into him re breeding. I'm sure while his pup grows he'll be asking you all sorts of questions and you can slowly get him to understand the importance of a responsible breeder.